2 CDs. 1:23 hrs. Listening Library. Jan. 2018. $24. ISBN 9780525532071. digital download. Gr 4–6—Kinsella's first book for children is the story of Ella Brook, whose mother is a fairy with magical abilities that often go awry. Each chapter focuses on one of these magical mishaps. Cassandra Morris is an expert narrator, fitting her voice to the character be it child or adult. Morris keeps her voice calm, collected, and still realistically young as Ella tries to assist her mother in navigating a high-tech wand. 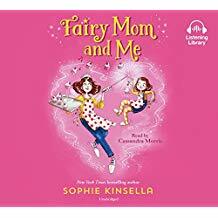 Morris easily switches to Ella's overwhelmed mother who tries to balance her home life with her fairy life with mixed results, giving her a slightly high-pitched, harried voice that evens out as she and her daughter untangle spells gone wrong. From elementary school boys to Ella's know-it-all fairy aunt, Morris is convincing in every role. VERDICT This is an easy, fast-moving audiobook that young fairy-loving listeners will embrace.